Passport photos can be made easily be through " Digtalworks Pro-Max " application. By using the Composition Tool, Compose the image within the Passport Photo Product by selecting Gloss - Matte - Metallic PRINTS from the Category tabs list within the 'Order Prints' page of the application. Although a business cannot be expected to make a significant income from passport photos in themselves, they can be used as a good source of prospective clients. Try approaching travel agencies for referrals. You may be surprised by the amount of clients who would like a portrait style passport photo rather than the average polaroid mug shot. You can even add your Logo to the bottom of the Passport Product Template. The Logo needs to be 500x110 pixels. How to prepare a passport for printing through Digital Works Pro-Max. 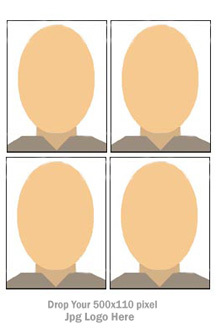 Subject: Head should be straight (vertical), Looking forward, Eyes open, Neutral expression, Full face visible, No sunglasses, No hats, caps or scarves and no flash reflections on face and No dark shadows. Background: Must be even, No shadows, can have light colour eg light blue, light green, light grey or white. Overall: Sharp, Good skin tone, Good Exposure, Centred. Prescription glasses can be warn however no reflections and eyes must fully be visible through them with no tint.